Blue used to spend her days wandering the sands of a small town beach outside of Athens, Greece. Every day she'd look for someone to play with. She would chase cars and follow families, looking for a little love and attention. 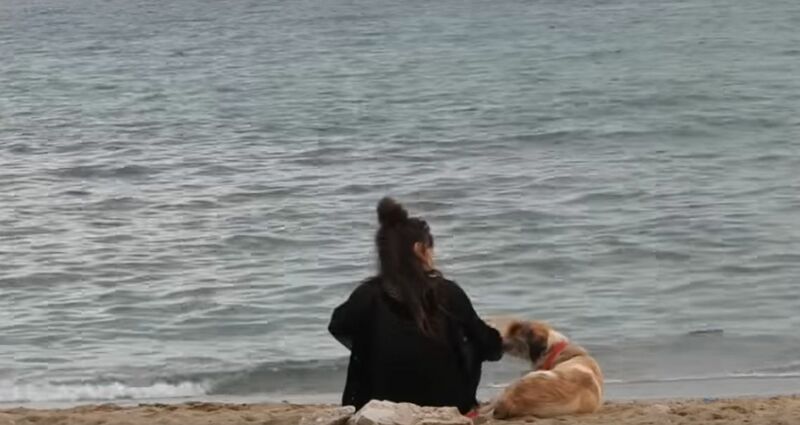 In the summer of 2016, Valia Orfanidou took her two dogs for a walk on the sand when Blue found her. Blue joined in on their walking, trying to fit in with the group. Her longing for human affection touched Orfanidou. She drove back to the beach and watched the dog play on the sand. "One afternoon I stayed in my car and watched her for hours. She was there on the shore, playing alone. Rolling in the sand. She looked happy and at the same time, she looked so sad, so alone and so vulnerable." Orfanidou said, in her video, found at the end of the article. After two sleepless nights, she went back to the beach and put Blue in her car. She didn't struggle. She just sat in the car like it was where she belonged. She drove two hours to Athens to a veterinarian. She then stayed with a friend until Orfandiou could return from her vacation. Blue, spent the next several months living with Orfanidou and her dogs. "Fostering blue was like fostering a soft cotton doll. She was so easy to handle, so quiet and easy going." Blue was placed with her "forever family," in October 2016. The family that adopted blue is home to several other animals, many of whom act as therapy animals for individuals with dementia, Alzheimers or MS. And Blue seems to have the personality to fit right in with the lifestyle of helping others. Orfanidou thinks that maybe Blue spent her lonely days on the beach not seeking help, but offering it. "She spent a summer chasing people and cars ... wagging her tail and begging for something. Maybe she was not asking for help, maybe she was offering it, to people who had no idea of the treasure they kept avoiding every day. Maybe all those souls spending a life of loneliness on the streets and reluctantly wagging their tails when you walk by are there to help you. Maybe instead of asking for something, they are actually offering us what we never imagined could be found so easily." You can find out more about Blue's Adventures on his Facebook page.